Description Found under rocks on the lower shore. Easily be handled , it will not try to escape. The edge of the carapace is similar to that of a crimped pasty. 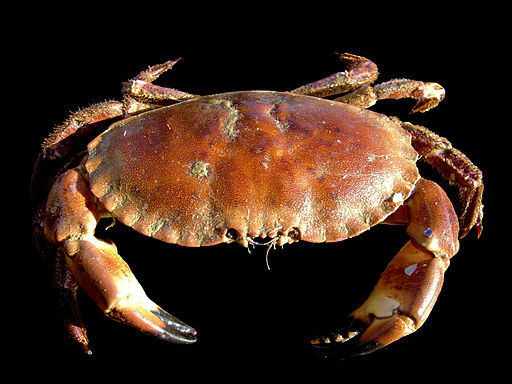 The pincers are black tipped and heavy set.Crab with a heavy, oval shaped body, easily distinguished from other species by its 'piecrust' edge and massive black tipped pincers. It is reddish-brown in colour with very large individuals having a carapace width of up to 25 cm although individuals are typically up to 15 cm. Habitat Found on bedrock including under boulders, mixed coarse grounds, and offshore in muddy sand. Lower shore, shallow sublittoral and offshore to about 100 m.